Our Early Childhood curriculum is designed for nursery and kindergarten age children. It is appropriate to the stage of development of the young child and promotes a reverence for nature, a joy in living and a sense of wonder about life. In our classrooms, we surround the child with beauty and simplicity. We provide a warm and loving place where children feel comfortable and at home. Special care is given to the selection of toys, the quality natural materials and the seasonal displays. The children’s play is open-ended and imaginative. Outside playtime is a regular part of the Waldorf Preschool and Kindergarten programs regardless of the season. This time outside fosters an appreciation for the natural world. When children are outdoors, nature can provide the the toys. Moss, bark, sand, and grass are transformed into playthings by tiny hands and imagination. All of these creations promote the fine motor skill of dexterity while vigorous outdoor play encourages a wide variety of imaginary activities. During the first seven years of childhood, children are building up their physical bodies through large whole body movements such as crawling, running, skipping, balancing and swinging. These essential gross-motor movements support brain development and are the foundations for executive function later in life. Stories are carefully chosen and presented to help nurture a child's developing imagination. We perform puppet plays with props or tell a story which help encourage the child to create their own inner pictures. This ability to form elaborate mental pictures support early language development and comprehension. Throughout the day, language development is enhanced through songs, verses and movement games. Learning is a whole body activity. During class the teacher engages in purposeful work, such as cooking, making crafts, tidying the room, baking bread or making soup. The children naturally imitate these activities by either joining in or assimilating them into their play thus learning the value of work. Through weekly routines (rhythms) at home and school, children are able to relax into a balance of activity, play and quiet time. 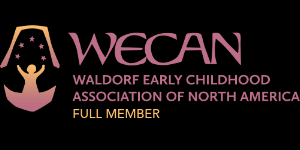 If you'd like to experience a Waldorf Early Childhood Class, visit our Garden's Gate Parent-Child Classes at the beginning of each new session. The first two classes of each session are open classroom days. There are age-appropriate classes from toddler through age 5. Registration is required 508-420-1005. We also have a number of story and craft workshops throughout the year. Please call this office to inquire. Tea & play with an Early Childhood teacher can also be arranged by appointment with our Enrollment Director. Call the school at 508-420-1005. Information about upcoming Early Childhood Events may also be found on our Facebook page.